Ambassador Philippe Ambassador Philippe J. Lhuillier appears in the local business show Ganhar Mundo to promote the Philippines as a most promising investment destination in Asia. A successful businessman himself, Ambassador Lhuillier was the first member of the diplomatic community in Portugal interviewed by the show which was aired last June 22, 2013. 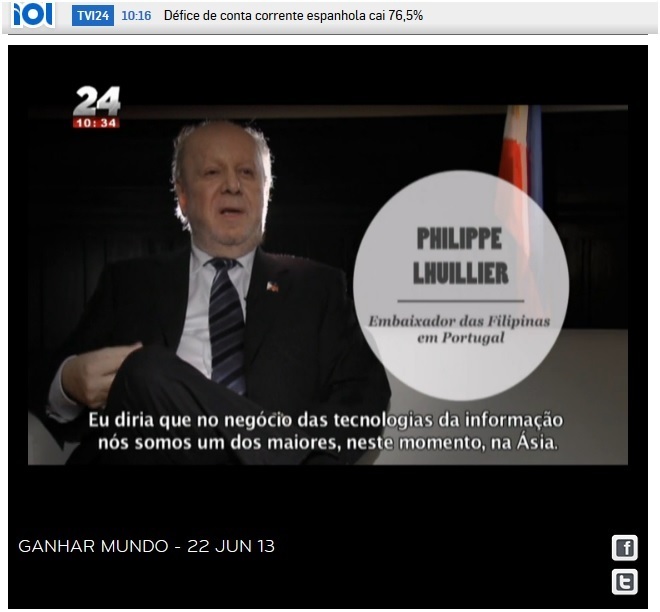 28 June 2013 - The Philippine Embassy in Lisbon reported that Ambassador Philippe J. Lhuillier was interviewed by Ganhar Mundo, a local business-oriented TV show to introduce the exciting new opportunities for Portuguese businessmen in the Philippines and to give practical tips on how to do business in the country. During the show, the Ambassador pointed to the recent investment-grade status earned by the country from the various ratings agencies as proof of the increased business confidence and consumer optimism in the country fuelled by the strong macro-economic fundamentals and high level of public trust in the administration. He explained that the Philippines enjoyed an impressive 7.8 GDP growth in the First Quarter of this year surpassing even China. Ganhar Mundo has a wide viewership of Portuguese businessmen and entrepreneurs searching for potential investment opportunities and alternative venues for putting up or expanding their business. Ambassador Lhuillier invited the viewers to consider the Philippines and take advantage of the wide-ranging efforts and reforms undertaken by the Aquino administration to improve the ease of doing business in the country. “There has never been a more exciting time to invest in the Philippines than now”, according to him.